Yesterday, thanks to the time machine that is cricket literature, we left Peter Roebuck in 1983 working on his new trigger movement with the bowling machine in the indoor nets deep below the Taunton stands. Today it is January 2003 and we are in the nets again, but this time at the Bombay Gymkhana Club where the Kent opener Ed Smith is also working on his trigger movement. Roebuck was not picked for England, Ed Smith was. Perhaps the difference was Vasudev Jagannath Paranjpe – Vasu for short – a former Mumbai player and coach. Two years before, after a session at the Bombay Academy, Vasu then in his mid-fifties ‘with an intense stare and a passionate, almost maniacal love of cricket’ had offered Smith an opinion about his game. 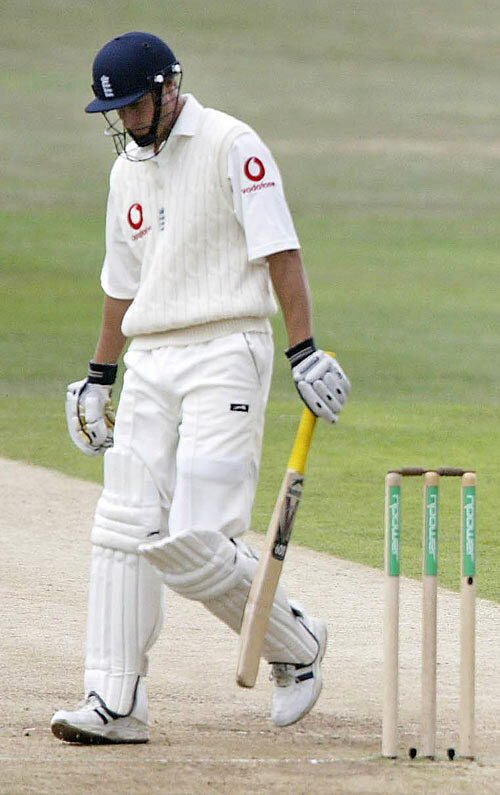 In 2003, Vasu is back again to watch Smith from all angles. VP: How many first class double-hundreds have you scored? VP: None! None! That is ridiculous. None! I have watched carefully for days now. I can’t see what’s stopping you. It is ridiculous. Do you want to do well or not? ES: Of course, I desperately want to do well. VP: Well, why no doubles then? … If I don’t see you scoring doubles for Kent and then playing for England against South Africa I will be furious. Doubles, OK, doubles. And with that Vasu walks off to watch someone else bat from all angles, and to tell them what to do. Back in England the season is not going well either for Kent or for Smith. By the start of July we see him at crisis point reaching out to his coach from school boy days, Chris Stone. They meet at the indoor school. Before he sleeps that night Smith’s phone beeps. It’s a text from Matt Banes the player most likely to take his place in the first team. It reads simply “Get a big hundred tomorrow”. There follows for our hero a purple patch of hundreds, of a double, of test selection on the 9th August, of the high drama and intensity of test cricket, of a first innings 67 at Trent Bridge, of Vaughan’s warm, “Well settled, well settled”, of Fletcher’s “Well played Big Ed, well played”, of that balanced calm state, of a first baller, of despair at Headingley and, at the Oval for the last Test, of fairy tales (Stewart’s last Test), nightmares (a bad lbw decision), glorious returns (Thorpe’s) and anxious exits (Smith’s). “Sadly I was on the wrong end of it all” writes Smith. Earlier he had defined succeeding at cricket as ‘making a difference’. At the Oval, Thorpe makes a difference, Smith does not. Thorpes makes the full England winter tour. Smith does not. Smith’s season of chaotic swings ends in uncanny symmetry as he returns to the sub-continent with England ‘A’ never to play Test cricket again. Cricinfo records it all: Ed Smith 3 Tests, 5 innings, 0 not outs, 87 runs, average 17.40.
Who was the more fortunate, Roebuck or Smith? Like two Hymalayan mountaineers, one was not chosen for the summit bid and never knows how he might have done, the other was, only to suffer the cruelest exposure and amputation, a lasting legacy of psychic loss. And who is writing a diary this season? Third man can’t wait to read it.